PETALING JAYA • A man distressed residents of an apartment complex in Petaling Jaya, Malaysia, after he dressed up as a suicide bomber, apparently for a costume party in September. Assistant Commissioner (AC) of Police Mohd Zani Che Din said that a police report was filed on Tuesday over the Sept 28 incident. "At about 7.40pm, residents at an apartment in Damansara Perdana came across the man who was dressed as a suicide bomber. It was for a Halloween party and he was spotted riding the lift," AC Mohd Zani said. The suspect had a fake beard and was dressed in white. 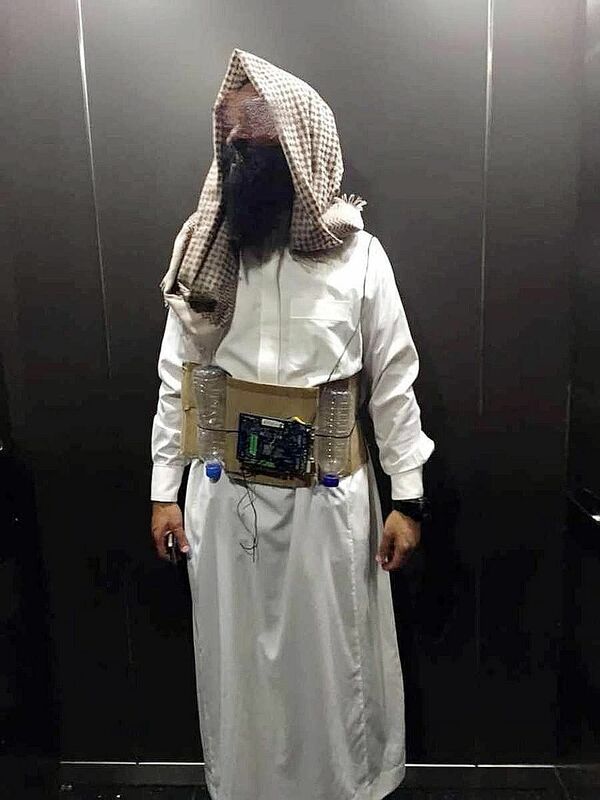 He fashioned a brown chequered towel into a headdress and wore a "circuit board" made of cardboard with two plastic bottles taped to its sides. AC Mohd Zani said those with information are urged to notify the police. The case has been classified under Section 506 of the Penal Code for criminal intimidation. AC Mohd Zani said that the man's attire was a sensitive issue for the general public, after recent events involving suicide bombers linked to Islamic State in Iraq and Syria militants.